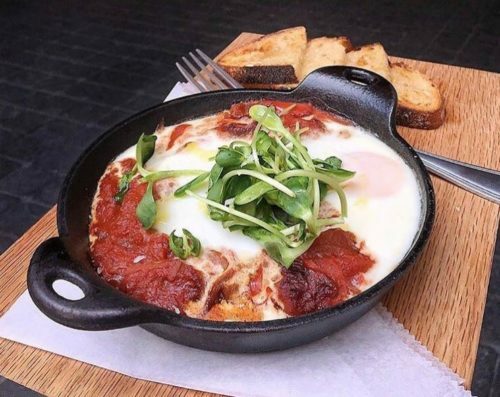 Shakshuka (alternatively spelled shakshouka) is a dish that originated from Tunisia, a North African country bordering the Mediterranean Sea. 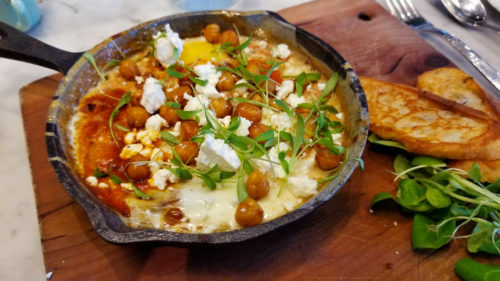 It’s made primarily of poached eggs in a tomato-based sauce with onions, peppers and spices served in a cast iron pan or a tajine. 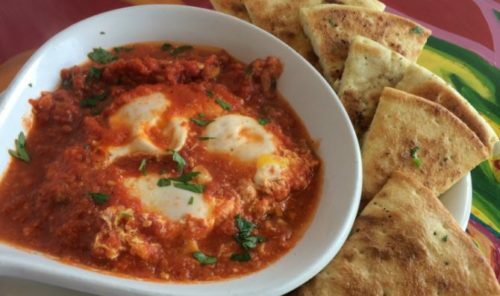 Although it is a popular breakfast/brunch dish in North Africa and the Middle East (especially Israel), it is hearty enough to be eaten for dinner as well. Naturally low carb and vegetarian, this traditional African dish has steadily grown in popularity in other countries including the United States in the 2010’s due to its healthy properties. Where can I get it? 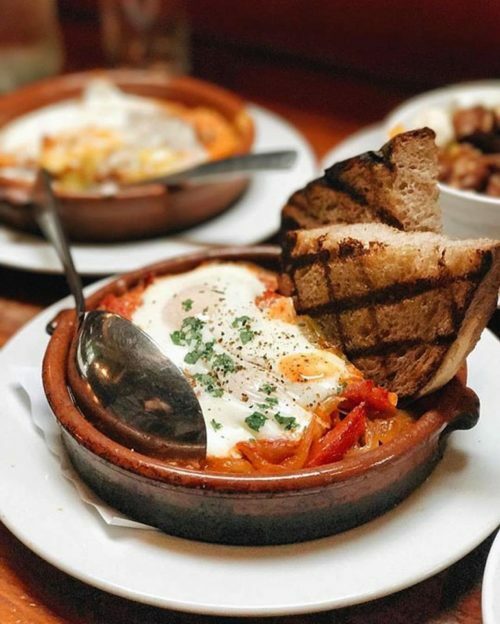 Shakshuka can be found in a number of places serving global cuisine, but you’ll have the highest chance of finding shakshuka at North African or Middle Eastern/Mediterranean restaurants that serve brunch. 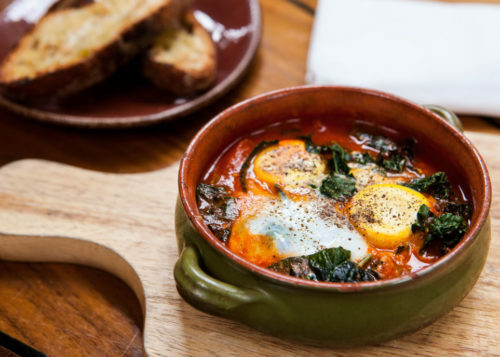 Here are some locations that served the best versions of this eggy dish. 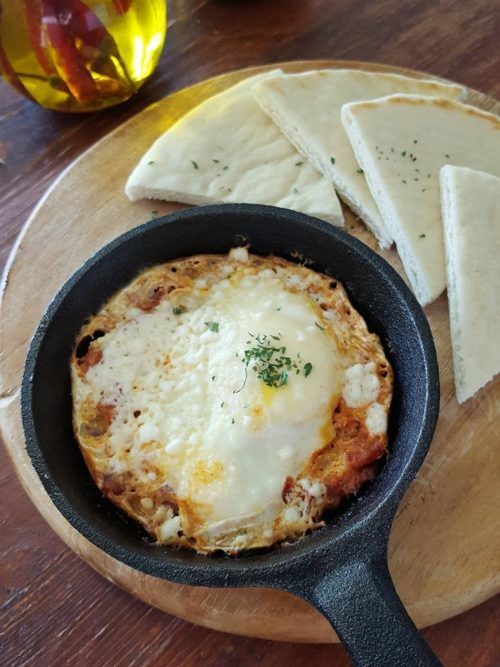 Looking for more places that serve shakshuka? You can find them on Glutto right here. How can I make it? 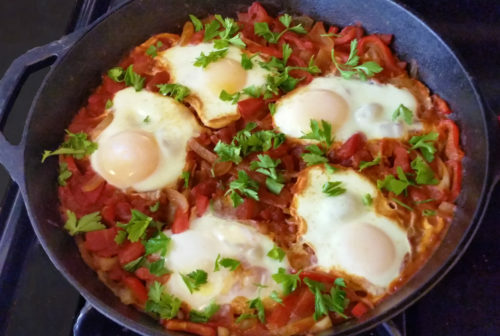 No matter what time of day it is, shakshuka makes for a satisfying, yet healthy meal. Here’s an easy recipe you can follow to enjoy this flavorful dish whenever you like. On the stove, put olive oil in a skillet (or tajine) and turn heat to medium high. Add onion, garlic and bell pepper. Stir for about 5 minutes, or until cooked. Mix in tomatoes, tomato paste, paprika, jalapenos/cayanne pepper. Crush tomatoes with spatula/spoon. Leave on medium-low heat for 25-30 mins. In the meantime, heat your oven to 350°F. Create evenly spaced indentations (1 for each egg) in the sauce with a spoon. Carefully crack an egg into each of the indentations so the yolk is intact. 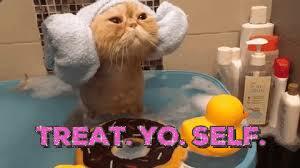 With your heat resistant mittens, place the skillet in the oven for 10 minutes, or until eggs reach desired doneness. Add salt & pepper to taste and garnish with parsley.